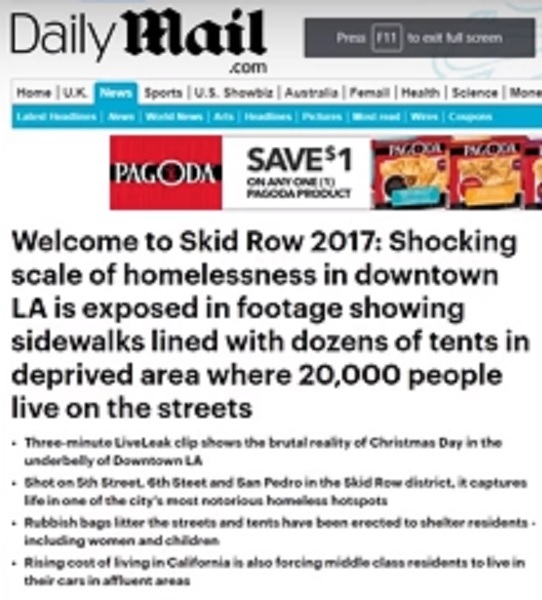 Shocking scale of Los Angeles’ homeless problem revealed in Christmas dashcam footage showing ‘tent city’ where 20,000 people live on the street. 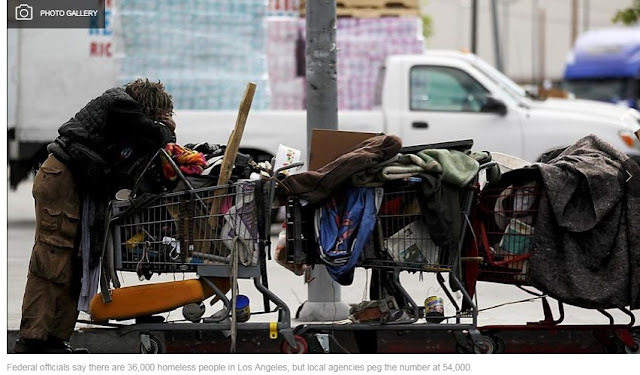 Video showing the tremendous scale of the homeless problem in downtown Los Angeles where 20,000 people live on the streets in tents and cars ["L.A. Times" states 36000, or 54,000 - see below..ed.]. How years of uninterrupted Democrat rule has turned US inner cities into the stuff of dystopian nightmares. Federal officials say there are 36,000 homeless people in Los Angeles, but local agencies peg the number at 54,000. In both the city and county of Los Angeles, the homeless population has jumped 12% in the last two years. The number of tents, makeshift encampments and vehicles occupied by homeless people soared 85%, to 9,535, according to biennial figures from the Los Angeles Homeless Services Authority. Countywide, more than 44,000 homeless people were tallied in January, up from more than 39,000 in 2013, the report said. Well over half -- nearly 26,000 -- were in the city of Los Angeles. Counting the homeless on the streets of East L.A.
How do you know who's homeless?